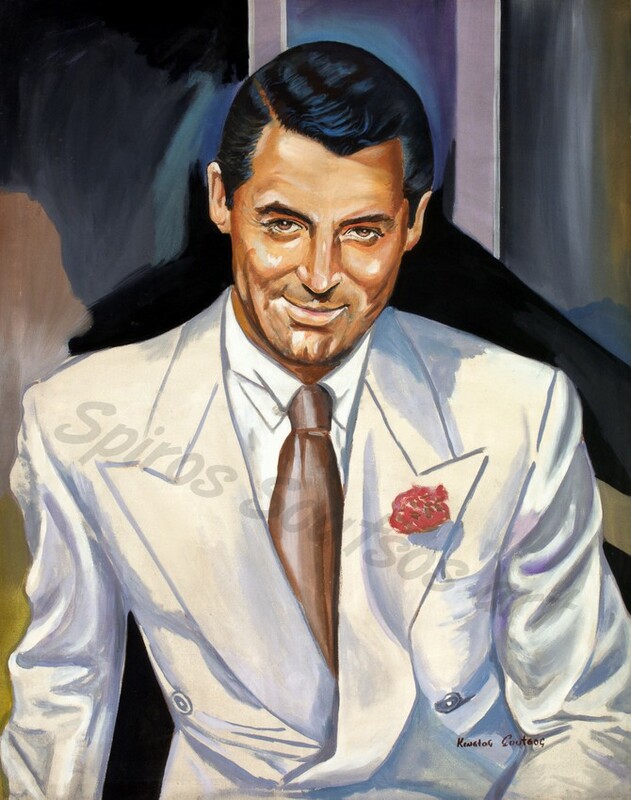 Cary Grant ( Archibald Alexander Leach, January 18, 1904 – November 29, 1986) was an English actor who became an American citizen in 1942. He is known for his transatlantic accent, debonair demeanor, and “dashing good looks”,and he is considered one of classic Hollywood’s definitive leading men. Grant’s first major comedy hit was when he was loaned to Hal Roach’s studio for Topper (1937), a screwball comedy film distributed by MGM. “. The Awful Truth (1937) was the breakthrough role of Cary Grant’s career, which established for him a screen persona as a sophisticated light comedy leading man in screwball comedies. In the next years, Grant appeared in several classic romantic and screwball comedies, including Holiday (1938) and Bringing Up Baby (1938), both opposite Katharine Hepburn; The Philadelphia Story (1940) with Hepburn and Jimi Stewart; His Girl Friday (1940) with Rosalind Russell; and My Favorite Wife (1940). During this time, he also made the adventure films Gunga Din (1939) with Douglas Fairbanks, Jr. and Only Angels Have Wings (1939) with Jean Arthur and Rita Hayworth, and dramas Penny Serenade (1941). Grant had four collaborations with Alfred Hitchcock. Grant appeared in the Hitchcock classics Suspicion (1941) Notorious (1946), To Catch a Thief (1955), and North by Northwest (1959). Grant was a favorite of Hitchcock, who called him “the only actor I ever loved in my whole life”. In 1952, he appeared in Monkey Business co-starring with Ginger Rogers and Marilyn Monroe. In the mid-1950s, Grant formed his own production company, Granart Productions and produced a number of films distributed by Universal, such as Operation Petticoat (1959), Indiscreet (1958), That Touch of Mink (co-starring with Doris Day, 1962), and Father Goose (1964). Producers Albert R. Broccoli and Harry Saltzman originally sought Grant for the role of James Bond in Dr. No (1962) but discarded the idea as Grant would be committed to only one feature film; therefore, the producers decided to go after someone who could be part of a franchise. In 1963, Grant appeared opposite Audrey Hepburn in Charade directed by Stanley Donen. Hitchcock asked Grant to star in Torn Curtain (1966) only to learn that Grant had decided to retire. Grant was one of the first actors to go independent by not renewing his studio contract, effectively leaving the studio system, which almost completely controlled all aspects of their lives. He decided which films he was going to appear in, often had personal choice of directors and co-stars, and at times even negotiated a share of the gross revenue, something uncommon at the time. Grant received more than $700,000 for his 10% of the gross for To Catch a Thief, while Alfred Hitchcock received less than $50,000 for directing and producing it. Grant was nominated for two Academy Awards, for Penny Serenade (1941) and None But the Lonely Heart (1944), but never won a competitive Oscar. He received a special Academy Award for Lifetime Achievement in 1970. In 1999, the American Film Institute named Grant the second greatest male star of Golden Age Hollywood cinema (after Humphrey Bogart).